One of the biggest names in the world of walkie-talkies is Cobra. This brand produces great quality devices that have various incredible features. The company is known for producing all kinds of walkie-talkies. You can find Cobra walkie-talkies that are long range, have water resistance and are long lasting with different power options. 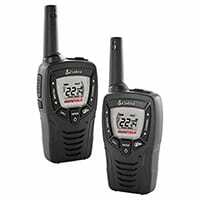 These walkie-talkies are great for cruise ships, long trips and can work perfectly both indoors and outdoors. There are different models produced by the company and you will definitely fall in love with their products. Cobra walkie-talkies are reliable and powerful. If you are looking for a good companion for your trip, then you should definitely check out the models from Cobra. Cobra is known to produce some of the best walkie-talkies available. If you are planning to buy a walkie-talkie from this brand, then here is a list of top five Cobra models available on the market right now. One of the most popular walkie-talkies out there is the Cobra CXT1035R. This amazing device has a great reception and excellent sound quality. The Cobra CXT 1035R has a great security system and can offer more than a hundred privacy codes. This Cobra walkie-talkie can also provide you with weather alerts and keep you updated in case of an emergency. What’s more is that you get a variety of voice modes and the device is completely user-friendly. The lightweight device makes the Cobra CXT1035R portable and easy to carry around. It comes with the batteries pre-charged, but you can also charge it with a USB cable. With amazing power options, and the thick protective layering over its exterior, this walkie-talkie is definitely a must-have for those long hiking trips. Among some of the best devices from Cobra, there is also the Cobra MicroTalk CX115A. With its sixteen mile range the device allows you to talk to your friends and family even in those locations where your cell phone doesn’t get any reception. The device is able to access 22 channels and with its front panel push buttons you can easily access these different channels no matter where you are. 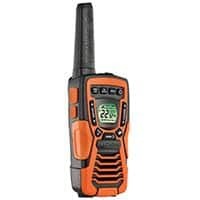 This walkie-talkie from Cobra allows you to stay updated with the latest alerts related to weather and emergencies by accessing NOAA and other certified channels for alerts. What’s more is that you get extra batteries with the set so that you can keep using your walkie-talkie all through your trip without having to charge it. The Cobra MicroTalk CX115A is designed to save power which extends its battery life. With its cool specs, the Cobra CX115A is a must-have! ​Another amazing device from Cobra is the Cobra CX312. This device has a range of up to 23 miles under ideal conditions. The walkie-talkies comes with a compact design so you can easily carry it around wherever you go without tiring yourself. The Cobra CX312 is able to access 10 NOAA channels which will allow you to stay prepared in case of emergencies and storms. This incredible device from Cobra can be used for a number of purposes and no matter how you plan to use it, the amazing features will help you stay connected with the world. The device is designed to save power so that you can keep using it all through your trip. The Cobra CX312 is water resistant and allows hands free communication. With all these amazing features the Cobra CX312 will prove to be a valuable companion for all your trips. A device worth mentioning on this list is the Cobra CXT 390. Cobra claims this device provides ultra-clear communication. The Cobra CXT 390 comes with front panel push buttons so that you can access any of the 22 channels with ease. The walkie-talkie allows you to shut off noise or unwanted transmissions while you are using it, so that you can listen to crystal clear sound from the other side. The display of the device is not only convenient to use, but also allows you to see all the details and the radio’s status at a glance. Get the Cobra CXT 390 today and enjoy hands-free, long distance communication at a very reasonable price. Another good Cobra walkie-talkie is the Cobra MicroTalk CXR925. Known for its excellent range and very good sound quality, this walkie-talkie is the perfect choice for taking with you on long trips. Despite its small and lightweight design the Cobra CXR925 delivers a wonderful amount of power. It has an effective range between 1.5 to 2 miles in many different environments. And because the Cobra CXR925 runs on Lithium batteries it also has excellent battery life. With several other amazing features, this walkie-talkie with the compact design and powerful specs will be an amazing choice to take on your next trip. In this section we suggest some accessories that you should consider purchasing for use with your walkie-talkie. The suggested accessories should work with Cobra products, but you should check if it is compatible with your specific Cobra model before purchasing it. One of the most popular accessories that people buy with walkie-talkies is the headset. A headset allows you to enjoy hands-free communication. If you are looking for a good headset to go with your Cobra device then you should check out the headset from abcGoodefg. With a reliable charger, you can keep your batteries charged and working no matter where you are. You can find some great chargers on the market but you should definitely check whether or not it is compatible with the types of batteries used by your walkie-talkie before buying it. But a good charger for Cobra MicroTalk radios is this charger from H﻿ome Wall. Are you planning to go on a long trip where you won’t have time to charge your batteries? 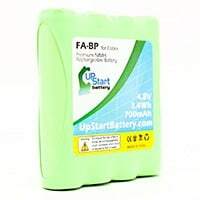 Then it is wise to purchase a battery pack that you can recharge and use whenever you want. We recommend these batteries for Cobra MicroTalk radios. Cobra is among the most popular brands for walkie-talkies. If you want to buy a walkie-talkie then you should check out some of their amazing products. What’s more is that you can also get accessories with your device to improve your experience. With the walkie-talkies listed in this guide you should be able to find the device that fulfills all your requirements.